For chilli oil, heat 5 tbsp sunflower oil until hot, but not smoking. Add 4 tsp chilli powder, wait 30 seconds then remove from the heat. Leave until cold, strain through kitchen paper, chill, and use as required. Preheat the oven to 200°C/gas mark 6. Stab each aubergine all over with a fork and bake for 30 minutes or until soft. Remove and leave to cool. Meanwhile, mix the oils, soy sauce, vinegar and honey. Toast the sesame seeds in a dry pan until golden then add to the soy mix. Cook the noodles for 3 minutes, until al dente. Drain and toss in half the dressing. Mix the ginger and garlic into the remaining dressing. Cut the aubergine in half lengthways and peel. Tear the flesh into long strips and mix in bowl with the remaining, garlicky dressing. Drop the spinach into a pan of boiling water. Return to the boil, drain and cool under cold water. 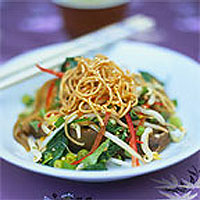 Squeeze dry, and mix into the aubergine with the peppers, spring onions and beansprouts. Add the noodles, garnish with coriander and serve.